The sweet flavor of sharing! Have you heard about "Cause Marketing"? 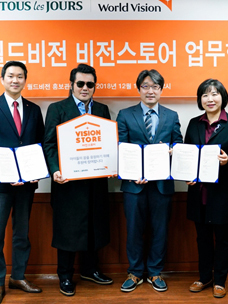 At its essence, it’s about establishing a connection between product sales and donations! That is, as consumers generate sales, a company donates a certain amount of money or products. Look around and you can find many examples. The Good Bread campaign run by CJ Donors Camp and Tous Les Jours is a notable example of Cause Marketing! Sharing of good bread, sharing of happiness! ▲ Tous Les Jours's good bread! 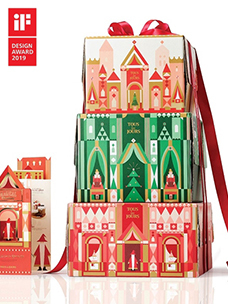 Tous Les Jours's Good Bread campaign, which started in September 2014, is a sharing activity where for every two "good bread" products a consumer buys at a Tous Les Jours store, a bread for sharing (sweet red bean bun) is donated to a child welfare institution. 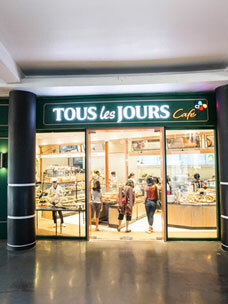 Tous Les Jours has been donating bread every month to after-school academies, group homes for children and senior welfare centers, as well as local child care centers, called the Study Rooms, sponsored by CJ Donors Camp nationwide. The saved bread for sharing is collected by teachers at welfare institutions in the neighborhood of each franchise / company-operated store at a designated date four times a month, and then shared with children at the institution. In addition, staff and executives from CJ Foodville are engaged in volunteer work on Friday of the second week every month, as part of "Good Bread Sharing Day," which involves the direct delivery of bread to welfare institutions and the beautification of their environment (cleaning, arrangement, facility renovation and tending of vegetable gardens). ▲ Children, wait a little! We'll go with the good bread! Seeing is believing! The same is true of the "Good Bread Sharing Day", which accompanies the delectable smell of freshly-baked bread and the joy of sharing bread. CJ Creative Journal covered the volunteer work of staff and executives from CJ Foodville on June 10. The sharing activity of the day started with the Tous Les Jours store in the office building of CJ Cheil Jedang. Sweet red bean buns were carefully prepared early in the morning in the store. The prepared bread was well wrapped by the staff and executives from CJ Foodville, who were taking part in the day's volunteer work, and then delivered to their various destinations! The good, carefully-prepared bread now goes to the children! Q. We wonder how the good bread is delivered from the store to children. A. Our store prepares the bread for sharing twice a month, and provides it directly to teachers at welfare institutions. Sure there can be difficulties with this work, but I think it's something I can't experience anywhere else. I've always been interested in volunteer work, so I’m happy to regularly prepare the bread for a good cause. I also feel responsible and rewarded as a manager of the sharing campaign. Q. Have you joined the volunteer work of the visiting welfare institutions? A. Yes, I joined it last January. I did it for three hours, though I felt the time was short, playing and eating snacks with the children at the institution, and cleaning rooms together. The children came out of their shells and we got to know each other well in a short period of time. When they said, "Please come again," I felt like it had all been worth it. Q. Are there any difficulties in taking part in the Good Bread campaign? A. I didn't find it difficult. I only have to prepare bread well. I consider myself fortunate to be able to work at a store involved in this good campaign. After I visited the welfare institution, the children come to mind whenever I prepare bread. That means I really go the extra mile to make sure the bread is of the highest quality. I'd welcome the chance to participate in more such volunteer work. ▲ After cleaning, they put the good bread neatly on the plates. Lee Hyeong-il, Kim Jae-hwan and Gwak Tae-hoon from the finance team of CJ Foodville carried 150 items of baked bread with them towards the Open Study Room in Sangam-dong, Mapo-gu, Seoul, where they would carry out other volunteering work by cleaning the place. They also bought and delivered a new vacuum cleaner as they had heard that the old vacuum had broken down. The Open Study Room has a deep connection to CJ Donors Camp. Indeed, the children at the institution have experienced various support programs from CJ Donors Camp, including the sharing of seats or the good bread. That’s one of the reasons children feel so familiar with CJ's brand images and one of the reasons why they are so interested in its products. The sweet flavor of the bread makes our children smile! Q. Could you tell us a little about the Open Study Room? A. We opened up a new church in the region in 1998. Back then, this neighborhood had barely been developed. There were many poor families and many children wandering here and there. We felt sorry for them, so we began to help them study and provided them with some snacks. Then we opened a local child care center called the Open Study Room in 2002. Now, we take care of some 39 students in elementary, middle and high schools here. Q. Today, volunteer workers brought with them the good bread. How do you feel? A. I feel very grateful. They helped us with kimchi-making last winter, and have regularly donated bread and cleaned rooms. I feel good knowing that they work together with the CJ Donors Camp. The Good Bread campaign is always welcomed by our children. Of course, there are some children who don't like red bean buns, but many eat it with relish, as it’s good for their health. Volunteer workers always donate a generous amount of bread so that we can share them with the children's families. As the name “good bread” implies, it is great to share the bread and a good cause with many people. ▲ They clean the children's study rooms with care, sweeping and wiping every nook and cranny. In the morning when the children were in school, the volunteer workers from CJ Foodville cleaned the center, sweeping and wiping every nook and cranny, despite sweating from the hot summer weather. Although it would be good to eat the good bread with the children at the clean center, volunteer workers had to finish their work because it was time to return to their usual workplace. I will definitely do it all again." ▲ Photo of children eating the good bread! They are as cheerful as the bread is sweet! In the evening, Shim Chi-sook, the head of the Open Study Room, took pictures of the children eating the good bread and sent them to us. Like their cheerful faces as they enjoyed the breads, we hope their days will be full of happiness! "Sharing makes us rich. The act of sharing helps us know who we are," said Mother Teresa. Sharing is not a difficult thing. If you find products listed as "Good Bread" at a Tous Les Jours store in your neighborhood, being such good customers, why don't you buy two of them? When you buy “good bread” someone can eat tasty “shared bread”, and that’s what the Good Bread campaign from Tous Les Jours is all about. Please don’t forget it.